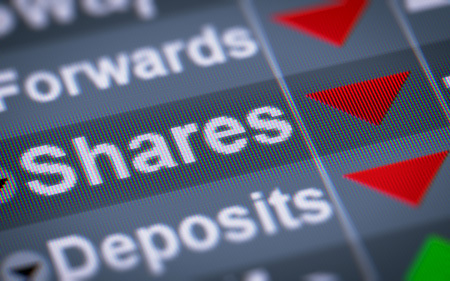 Key things for investors to bear in mind are that: corrections in the order of 5-15% are normal; in the absence of recession, a deep bear market is unlikely; selling shares after a fall just locks in a loss; share pullbacks provide opportunities for investors to pick them up more cheaply; while shares may have fallen, dividends haven’t; and finally, to avoid getting thrown out of a long-term investment strategy it’s best to turn down the noise during times like the present. There are basically three drivers behind the plunge in share prices. First, the trigger was worries that US inflation would rise faster than expected resulting in more aggressive rate hikes by the US Federal Reserve and higher bond yields. 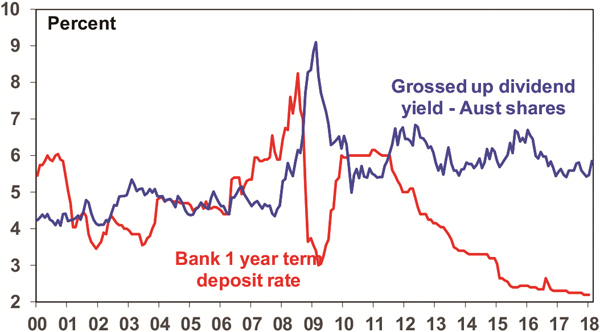 Flowing from this are worries that the Fed might get it wrong and tighten too much causing an economic downturn and that higher bond yields will reduce the relative attractiveness of shares and investments that have benefited from the long period of low interest rates. Finally, and related to this, the speed of the pullback is being exaggerated by the unwinding of a large build up of so-called short volatility bets (ie bets that volatility would continue to fall) via exchange traded investment products that made such bets possible. The unwinding of such positions after volatility rose further pushed up volatility indexes like the so-called VIX index and that accelerated the fall in US share prices. Quite why some investors thought volatility would continue to fall when it was already at record lows beats me, but this looks to be another case of financial engineering gone wrong! First, periodic corrections in share markets in the order of 5-15% are healthy and normal. For example, during the tech com boom from 1995 to early 2000, the US share market had seven pull backs greater than 5% ranging from 6% up to 19% with an average decline of 10%. During the same period, the Australian share market had eight pullbacks ranging from 5% to 16% with an average of 8%. All against a backdrop of strong returns every year. 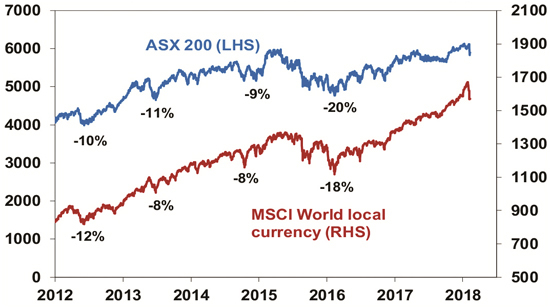 During the 2003 to 2007 bull market, the Australian share market had five 5% plus corrections ranging from 7% to 12%, again with strong positive returns every year. More recently, the Australian share market had a 10% pullback in 2012, an 11% fall in 2013 (remember the taper tantrum? ), an 8% fall in 2014 and a 20% fall between April 2015 and February 2016 all in the context of a gradual rising trend. And it has been similar for global shares, but against a strongly rising trend. See the next chart. 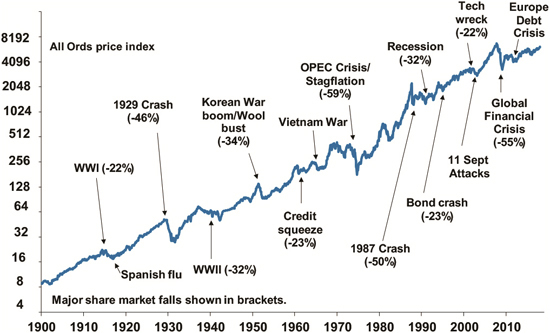 In fact, share market corrections are healthy because they help limit a build up in complacency and excessive risk taking.